Try to picture American cities if they had started building world-class bike infrastructure en masse in the 1970s, instead of 40 years later. How much safer would our streets be today? How much more active would we be? How many more years would people have enjoyed instead of getting their lives cut short by traffic crashes or chronic cardiovascular disease? It’s not that far-fetched a scenario. Davis, California, began to build protected bike lanes in the early 70s, drawing significant interest from other cities. But instead of embracing these street design concepts, American transportation engineers shunned them for a generation. A new paper from Bill Schultheiss, Rebecca Sanders, and Jennifer Toole of Toole Design Group looks at what led the engineering establishment down this path and “delayed the development of urban bicycle transportation networks in North America for decades” [PDF]. In the 1970s, the Davis bike network did inspire other cities, especially in California. It also highlighted the need for engineering design guidance, so the innovations in Davis could be refined and then replicated in other places. In 1972, the engineering firm DeLeuw Cather surveyed people in Davis and found they preferred to both bike and drive on streets with bike lanes than those without. Few crashes occurred in the bike lanes, but the study noted some difficulties that will sound familiar today: potential conflicts caused by passengers opening car doors, or between cyclists and pedestrians on sidewalk-grade bike lanes, for instance. As more California cities installed bike lanes and paths, a few municipalities passed mandatory side path laws, which required people to ride in a bikeway if one was available. This provoked a reactionary movement among some cyclists, led by the engineer and amateur bike racer John Forester. To discredit California’s emerging bike infrastructure, Forester conducted personal “experiments” where he attempted left turns off sidewalk-level bike paths at high speeds. Forester “published his account of this ride as ‘the one valid test of a sidepath system’ that proves sidepath style bikeways were ‘about 1,000 times more dangerous than riding on the same roads,'” Schultheiss writes. Although Forester’s experiment was obviously anecdotal and highly subjective, his credentials as an engineer helped lend a scientific veneer to his ideological campaign. Forester sapped this momentum. He seized on some of the safety issues pointed out by DeLeuw Cather and others as evidence that, as Schultheiss puts it, “all methods of separation were unsafe, failing to acknowledge the studies that had found that streets with bike lanes were safer than streets without.” By gaining leverage over influential guidance in the street engineering profession, Forester stunted bikeway development around the nation. The American Association of State Highway and Transportation Officials produced the first edition of its bikeway guide in 1974. It was surprisingly progressive by the standards of the time, with recommendations about protected and unprotected bike lanes. Although it cautioned against protected bike lanes, the 1974 guide advised cities where different types of bikeways are appropriate, taking into account factors like motor vehicle speed and volumes. By the late 1970s, Forester was president of the California Association of Bicycling Organizations, which shaped the Caltrans Bicycle Guide in 1978. That document, says Schultheiss, “codified vehicular cycling as the primary method for accommodating bicyclists.” When AASHTO wrote its next bicycle guide in 1981, the 1978 Caltrans guide “was used as a starting point,” according to Richard Lemieux, an engineer who was the FHWA bicycle program manager at the time. Dedicated bike infrastructure was out, riding a bike like you drive a motor vehicle was in. Another version of the AASHTO bikeway guide was not produced until 1991. Interest in bike infrastructure was flagging, and the 1991 guide did not contain many changes. It took another wave of research funded by the 1991 federal transportation bill for the engineering establishment to question the conventional wisdom that had hardened around Forester’s vehicular cycling philosophy. That decade, the FHWA oversaw a number of studies examining the safety of bikeways, and some of the findings indicated that on-street bikeways were indeed safer. Successive versions of the AASHTO guide showed marginal progress, but it wasn’t until cities took the initiative and began implementing protected bike lanes in the 2000s that American bikeway engineering caught up to where Davis had been in the 1970s. As Steven Higashide recounts in the Atlantic, urban DOTs in New York, DC, Chicago, and other cities filled a vacuum left by AASHTO and popularized protected on-street bike lane designs independently. By banding together as the National Association of City Transportation Officials and producing an Urban Bikeway Design Guide, they have led hundreds of other cities to implement the type of bike infrastructure that John Forester disdained. Since 2010, the overwhelming preponderance of research has shown not only the people prefer to ride in dedicated bike infrastructure, but that these street designs improve safety for everyone. From the NACTO Bikeway Design Guide. The federal guidelines for bikeways were implemented in the early 70’s, but very few facilities were built to those specs. Too expensive, without federal funding, which was limited and competitive. The 80’s were a decade when Republican executives-President Reagan and CA governor Deukmejian- probably more states slashed or zero funded bicycle programs, so any city or county efforts would have been local funding. Broward county, FL where I served as chairman of the Bicycle Safety Committee then, passed an ordinance mandating bike lanes or separate paths when they built or widened roads, but these were scattered about and basically useless for transport. There have been more unprotected bike lanes built in Ft. Lauderdale since then, but no studies to see if they improve safety yet. Marin county (and cities in the county) where I live now, has built a few dozen miles of bike lanes. There’s already been several collisions with cars and bikers using them, at driveways and intersection. I’ve moved on from trying to educate the new breed of bike lobbyists about the lessons we learned in the 80’s.Marin activists were uninterested, when they burned through $30 million in federal and state funding, to pave less than 20 miles of lanes and paths. More interested in safer pedestrian programs. See my Look Twice for One Less Car graphic on my FB page Velorution2020. Again, if the store is on the corner of the intersection under which one must ride, how does one get to the store? Less convenience in reaching destinations is a poor way to approach gaining cyclists. Completely segregated facilities are fine when there are destinations at either end, no destinations between ends, and no cross-traffic conflicts. They make nice riding. See Albuquerque’s system of paths along its arroyo system. I think its possible you might have misunderstood what I was saying. The turning conflicts at 15th and K between a small number of motorists and enormous numbers of pedestrians and bicyclists look to me like they were corrected between June 2014 and July 2015 when the traffic light was replaced. I don’t think it’s an issue of “not knowing enough”, as much as a light cycle in the 2011 video that wasn’t designed for the numbers of people using the intersection. Your critique of 8-80 infrastructure would also apply to the pedestrians in the crosswalk, if I understand you correctly. The turning conflicts in general between cars and pedestrians and bicyclists are part of my everyday existence. I am threatened by them literally every single day on foot. I agree with you that there are more effective and less effective treatments. I don’t plan to read pro-VC blogs but thank you for the suggestion. Much appreciated. Thanks for sharing your experience with Professor Furth. Maggie asked Simac about Broward County’s attitude toward vehicular cycling, which attitude she thinks may be dangerous. I haven’t seen Simac reply, but an answer is in his statement above. paths when they built or widened roads”. Governments that mandate bike lanes or separate paths are opposed to vehicular cycling. Read the article before you comment. Thanks. An article that appeared in the Sun-Sentinel at some time or other? The URL you supplied won’t find it. Provide a useful URL or shut up. I’ve checked, it works for me. Thank you for your thoughts on an article you haven’t read. Don’t tell me to “shut up”. That’s over the line, sir. This is about so much more than your ego, whether you see that or not. The societal costs are in the hundreds of billions of dollars. The engineering you’ve studied is in a larger context of science and climate, with costs that are escalating. Whether Florida will improve safety for people to get around on bikes as urgently as it remakes itself for climate change and rising sea levels is an open question, but it’s not an unconnected one. The question isn’t about whether an amateur bike racer should proceed at full speed on a sidewalk. And John Forester, I’ll drop the back and forth with you here. Thank you for taking the time to discuss. Sorry we couldn’t reach common ground. Best wishes to you. Maggie, I am sorry. I apologize greatly. I tried to move the URL you provided to my browser, and it did not work. Just got me the newspaper, but no way to progress. When I clicked on your message, although the complete URL was not visible, the complete version was sent. My fault. The article is about sharrows. You asked Simac if the “sharrow attitude” (to give it a name) existed in Broward County when he was there long ago. Sharrows are a rather recent occurrence; I doubt that Simac saw any sharrows during his time in Florida. The sharrow debate concerns the relative safety of curb-hugging, cyclist-inferiority cycling and rules of the road cycling. Where there are intersections and driveways, rules of the road cycling is safer than curb-hugging, cyclist-inferiority cycling. The founder of Cycling Savvy said that the moment she switched from curb-hugging cyclist-inferiority cycling to rules of the road cycling, she discovered that immediately all the motorists around her learned how to drive properly. They didn’t change their methods; it is just that by obeying the rules of the road she was no longer forcing herself into the car-bike collision situations produced by curb-hugging cyclist-inferiority cycling. Maggie keeps harping about cyclist safety, yet she opposes the reasonably safe rules of the road cycling in favor of unspecified systems that violate the rules of the road, thereby creating car-bike conflicts that presumably increase car-bike collisions. This contradiction would puzzle the casual observer unless he knew about Motordom’s seventy-year program to make motoring more convenient by frightening and legislating cyclists off the roads. The American public, as does Maggie (so far as is seen), is controlled by the fear created by Motordom to make motoring more convenient. That is the tragedy of American cycling. the url worked for me. the article should be reposted to this blog then we could have a civilized debate. I do think this article we’re commenting about now, misrepresents your accomplishments and support you on correcting that, because your work should be honored in the velorution for getting us off the sidewalks, but let’s work this out civilly. oh, see that you did find it. The sharrows sign is lame, in that an educational opportunity is wasted with the headless horseman graphic, but we have them here in Marin county. I do get back to my hometown of Ft. Lauderdale regularly, and bicycle and drive and walk to get around. I’m pretty sure there’s no must use the bike lane law, but will have to check up on that. Getting hit twice by motorists who “never saw me”, even though I was riding visibly and legally in daylight, did ‘frighten me”. So I prefer low traffic, neighborhood routes to cycle on, but ‘you can’t get there from here’, just using them. We mapped out the county to show other riders those green routes, but there were a whole lot of yellow and red routes. I haven’t been able to persuade any of this younger generation that bike lanes are an expensive distraction, but they may have to come to that awareness themselves when they see how few are built and they turn out to have their own dangers. From the article and the comments, it doesn’t sound like much has changed in drivers’ attitudes since when I lived there and bicycled for transportation in the 70’s and 80’s. Las Olas actually has a bike lane, farther east than this section of high end retail they’re talking about, which has been deliberately slowed down for almost 20 years with various engineering tactics. Sharrows are national, they have them here in Marin County CA where I live now. The attitudes are shared widely across the country I believe, but maybe acted out on more in the south. Florida has always been a dangerous state for bicycling, but Louisiana has the highest fatality rate per mile cycled last time I checked. John’s answer seems to misread your question, but that may be in response to other debates here. I haven’t heard that Florida mandates use of bike lanes when available, so the reporter might have just gotten that wrong, still a better article than the ones we usually got when we were newsworthy. One lede started by calling me a “health food freak and a bicycle nut.” I told him to at least get his cliches right. I’m going to have to read more about these other plans mentioned and will get back to you, when I should be working. @jsallen – A question was asked, I answered it based on information that Forester provided on his website and indicated pride in. That is not an attempt to impugn his character, I let his own pugnacious prose style, his abhorrent sexism, and his work shilling alongside Cox and O’Toole at anti-transit Tea Party venues speak for themselves. @Maggie – There is nothing “scientific” about this form of interlocution, it is an imperious affectation in this context. On fora devoted to vehicular cycling, or bicycle driving, or whatever it’s called this week, JF and his cohort refer to each other with initials, a chummy insider affectation. I have no doubt that a link to this piece and a “fly, my pretties, fly!” exhortation appeared in one of these fora last week, followed by initials. @jsallen – In fact the NYPD does enforce laws against riding on sidewalks, even charging bicyclists who did not actually ride on sidewalks. @Maggie – People have been making this excuse for decades for someone who moved to Berkeley, California, as a child. @Clarence Eckerson Jr. – I got into fisticuffs with this container. @Joe R. – It is a fair point that 1970s research (cited in Forester’s Effective Cycling and repeated as holy writ by VCers ever since) covered the substandard infrastructure of the era, and found it wanting. In the late 1990s there was further research that tried to replicate the 1970s studies, and it found a dramatic improvement. Which is no surprise, since there are parts of the country where VC dogma failed to impede more modern infrastructure, but parts where there had been little change in two decades. There was now about half as much ammunition for VCers to use, but guess what? They still used it, without missing a beat. @Marven Norman – It became evident long ago. Everyone from the AAA to the Tea Party uses VC ideology as a do-nothing excuse when it comes to bicycles. Ever hear of the Big Dig? It was the most expensive highway project in U.S. history, ultimately $20B (still being paid for), making major changes to metropolitan Boston. VC dogma had a death grip on bicycle advocacy in the area for the 25 years that this project took, and as a result not one penny went to bicycling. @Maggie – You see, “the law” refers to the motor vehicle statutes including certain obscure minutiæ when convenient, the “rules of the road” as declared by an expert (Forester) when convenient, and strict compliance with VC dogma when convenient. Fail on any of these points, when convenient, and you’re automagically no longer in the cadre of competent and legal bicyclists being advocated for. Isn’t that convenient? I just taught a group cycling class on Saturday. We had a 9 year old boy in the class who made a vehicular left turn from a 4-lane road and also a vehicular left turn from a 2-lane roundabout. Yes, he was with 3 adults, but all went well. I have also been observing cyclist counts and crashes, using crash reports submitted to the Ohio Dept of Public Safety and the bicycle counts collected by ODOT using automated tube counters. My observation of the data was a 50% increase in cyclists, from a before daily average of 149 cyclists to an after daily average of 224 (across 3 locations). My observation was a 420% increase in crashes, from a before yearly average of 2.5 crashes to an after yearly average of 13 crashes. The crashes rose from an average of 1.5 crashes per year in 2011-2014 to an average of 13 crashes in 2016-2017. There were 0 crashes in 2015, the year the bike lane was in construction. That is a 767% increase in crashes. I’m not sure where you found the 25% number? Whenever someone brings up the 8-80 argument for separated bike lanes, I think of an experience I had riding the 2-way separated bike lane in Columbus. I was traveling contra-flow and a motorist was blocking the bike lane because he/she had pulled forward from a side street to look for traffic. You see, a motorist has to pull out 20′ from the corner (10′ bike lanes + 10′ parking lane) to see around the parked cars. It happens all the time at the unsignalized intersections (12 of the 19). I decided to ride behind the car blocking the bike lane. As I rode behind the car, an oncoming car turned right into the side street. I ask myself, would an 8 year old expect that this might happen? Would an 80 year old be able to stop in time to avoid a collision? I think we need to evaluate these separated bike lanes before coming to the conclusion that they are safer for cyclists. Some of the studies to date are using flawed methodology. Comparing traditional bike lanes with separated bike lanes which have different characteristics (1-way, 2-way, contra-flow, separation by parked cars, separated by raised posts) is flawed. Comparing two streets with different characteristics (1-way, 2-way, traffic volumes, # lanes) and different types of bicycle infrastructure is flawed. Declaring that census blocks are bike lane, sharrow or no infrastructure areas and then comparing the crashes and number of commuter cyclists using census data is flawed. We need to study before and after bicycle counts and crashes on the same street. I have been doing that in the Columbus 2-way separated by parked cars on a 1-way street bike lanes. I have come to the conclusion that this was the wrong type of infrastructure for this street. We can wait another year for the 3rd year of data to be collected. But will 8 more cyclists be injured while we wait? Will this separated bike lane remain for 6 years like the failed separated bike lane in the same area 40 years ago? I’ve read studies from NYC and studied the 1-way separated bike lanes on both sides of a 2-way street in Cincinnati and conclude that these are reducing crashes. Please let the traffic engineers design these bikeways. Make sure your engineers collect cyclist counts on the street before the infrastructure is built. I wish we could convince NHTSA that we should be collecting single bike, bike/bike and bike/pedestrian crashes, but the study of traffic safety is so car-centric that states are only required to collect crashes that involve a motor vehicle. We are not even required to keep track of dooring crashes because the motor vehicle is “not in transport”! I’m extremely disappointed that Columbus did not collect before cyclist counts on the parallel street that had a 1-way buffered bike lane built. We should be able to compare the safety of the two streets, which are very similar except that one has morning commute traffic and the other has evening commute traffic. We can compare the crashes: the separated bike lane street increased 767% (from average of 1.5 to 13 per year) and the buffered bike lane street increased 300% (from average of 0.5 to 2 per year). I’m sorry to hear a motorist blocked your way in the bike lane. That certainly would have been unpleasant and unneighborly. Thanks for sharing your experience and conclusions. Why would you not like to comment on who is at fault in traffic crashes? Bless your heart, but I’m not sure families of victims are better off for that. At any rate, thank you for sharing your thoughts. There is some cherry picking of statistics here. I found many documents which contradicted each other based on incomplete or misleading information, including the Ohio engineer’s initial link to an out of date document. It’s apparent that there are those who preferred the street in its before configuration, and there are other locals who described the before as a death trap. I don’t live in Columbus so I’ll leave my impressions there. @Jim Dyer That is not true. The Big Dig funding required a number of bicycle-related mitigation measures including, for example, the very nice bicycle-pedestrian bridge over the railroad tracks on the north side of the Charles River, and improvements and extensions of paths. As president of the Boston Area Bicycle Coalition and a participant in Citizens for Regional Transportation, which advocated for those measures among others (including above all a north-south rail connection which would bridge the only one-mile gap in the east-cost Amtrak corridor between Miami and Portland, Maine — still not built, though advocated by former Democratic Governor Mike Dukakis and republican Governor Bill Weld), I advocated for those improvements. 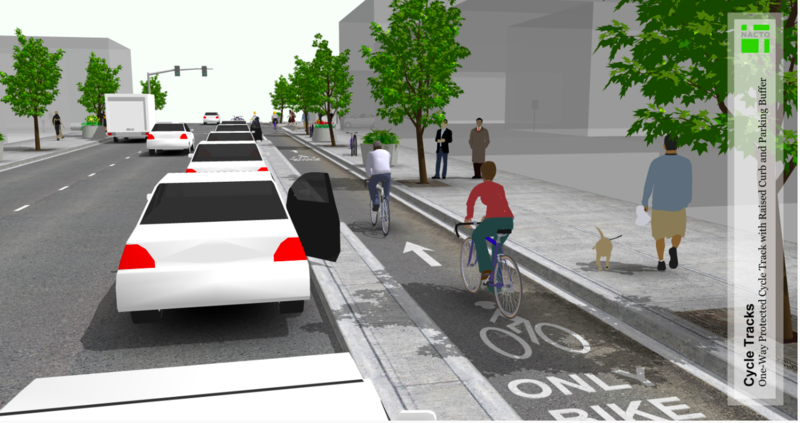 If the cyclist in the illustration from NACTO was using the general traffic lane (outside of dooring range of the parked car), she wouldn’t have to deal the passenger dooring her or dealing with pedestrians crossing the cycle-track mid block. I’m not sure how proponents of these sorts of facilities expect to convince people how great they are, when the illustrations point how the rather obvious safety deficiencies. I don’t like to blame the victim. The police officer indicated unknown in the crash report for “unit in error”. I wasn’t there. I do ride the Summit St bike lanes to evaluate them. I rode the 15th St 2-way separated by parked cars on a 1-way street in DC before ours was built and decided that it was unsafe for many reasons, mainly because cyclists are hidden by parked cars and motorists are not expecting contra-flow cyclists. I tried to convince city staff and bicycle advocates that the original design of a 1-way buffered bike lane design was a better solution, but was unable to do so. Here is more information on the types of crashes which have occurred in the Summit St bike lanes. 12 of the 15 crashes were injury crashes. 5 of cyclists were contra-flow. 8 of the 11 crashes were injury crashes. 6 of cyclists were contra-flow. A right hook is a motorist turning right and hitting a same direction cyclist. A right cross is a motorist turning right and hitting a contra-flow cyclist. I counted 2 extra crashes in 2017 than the official study I posted earlier. One was at Summit & 8th (south of the separated bike lanes) involving a contra-flow cyclist in the 1-way bike lane. The other was after the study was presented. The crashes have decreased from 2016 to 2017. The bicycle signals with exclusive phases for straight through cyclists and right turning motorists (installed during 2016) have decreased the angle crashes at signalized intersections. The problem is that only 7 of the 19 intersections are signalized. Another problem I perceive is that this street is nearby Ohio State University, where there are drivers unfamiliar with the infrastructure attending school and artistic and sports events. Hopefully I am wrong and this street will be safer over time. I don’t like to see cyclists being injured. You made a comment earlier that VC advocates insult the intelligence of others. What I try to do is study data and point out what is truly safe rather than what is perceived to be safe. Do you agree with me on that approach? I have yet to agree with VC advocates on anything related to cycling infrastructure in US cities. However, I understand their views are sincerely held. I’m a fan of the NACTO guidelines and glad they were developed. They make a big difference in my quality of life and the viability of substituting bike trips for short car trips. I don’t really have a good word for how appalling the idea that vehicular cycling should be reserved for those brave enough and everyone else should drive instead is, to me. As a planet, we have run out of time to indulge this conceit. Our cities’ long term existence depends on making zero emission trips possible for everyone. I believe that OSU football and arts fans have the capability to adjust to this. VC ideology having a death grip on bicycle advocacy at any given moment in history is a laughable notion. Widen the roads & allow for properly sized lanes for cars & bicycles, using bridges for pedestrians & tunnels for animals (& smart crossing). It is time for a newer design as the the new design has not been better than the old, shown by the facts that accidents, injuries & deaths have skyrocketed since implementation. The new designs are not good, they are dangerous. They are not accepted by anyone, except in the theoretical sense that some people “feel safer”. No doubt walking a five year old down what is effectively a private road on the taxpayer’s dime is a beautiful thing in its own little fantasy world. It is not inclusive, it is not good design, it is not comprehensive, & it does not allow connected travel. It is about as big a bust as one would have suspected of it. It is time to move on. In a city, the only properly-sized car is a golf cart.